Audrey Wagstaff earned a “Distinguished Teacher of the Year” award. 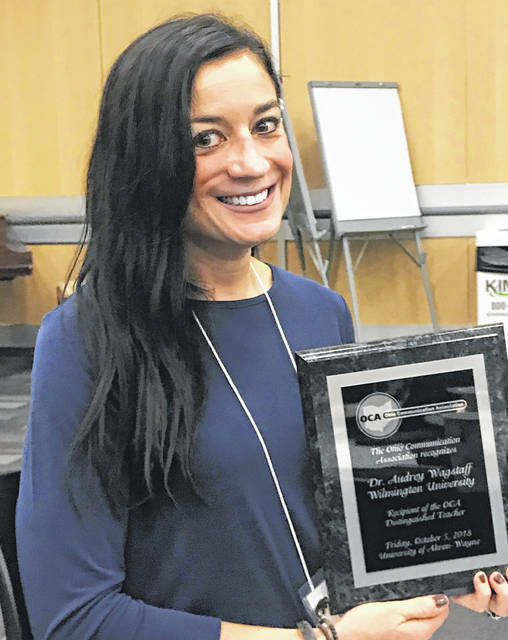 WILMINGTON — Wilmington College’s Dr. Audrey Wagstaff accepted the “Distinguished Teacher of the Year” award at the Ohio Communication Association’s annual state conference last weekend at the University of Akron-Wayne College campus. Wagstaff, an Associate Professor of Social Science who earned tenure at WC this past spring, has been at the College since 2015. Wagstaff, who teaches research and statistics courses to all social science students, has collaborated with them on a variety of projects. Her collaborations have also resulted in several national, regional, and state presentations and publications including an Ohio Communication Journal manuscript about attitudes toward marijuana legislation in Ohio she co-authored with alumnus Theresa Knopf (’17). That article won the Central States Communication Association’s top manuscript in 2018. “Dr. Wagstaff not only teaches and advises me, but she inspires me,” alumnus Travis Scheadler (‘18) wrote in his nomination letter. “Her commitment to Wilmington College students is unbelievably authentic and inspiring. I am honored to nominate her for this prestigious award.” Wagstaff and Scheadler published an article about changing attitudes toward female athletes in “The Sport Journal” this summer. In addition, Wagstaff, who describes herself as an “eclectic scholar,” and her students have won “Best in Class” awards in 2016, 2017 and 2018 at the College’s annual research forum and the “President’s Choice” award in 2018. Wagstaff also serves the College as the Area Coordinator of Social Sciences, Faculty Athletic Representative, and Clerk of the Assessment Committee. She holds a Ph.D. in Communication Studies and an M.A. in Journalism from Kent State University and a B.A. in Communication from Hiram College. She lives in Clarksville with her family. https://www.wnewsj.com/wp-content/uploads/sites/22/2018/10/web1_Wagstaff-OCA.jpgAudrey Wagstaff earned a “Distinguished Teacher of the Year” award.